TAKENOURA, Japan -- On a chilly morning last weekend, a 57-year-old Japanese man adjusted his diving mask before heading out to sea from the tsunami-hit northeast coast. Yasuo Takamatsu is learning to scuba dive in hopes of finding the remains of his wife. As Japan marks the third anniversary of the 2011 tsunami Tuesday, 2,636 people remain missing, their bodies presumably swept out to sea. Another 15,884 have been confirmed dead. Takamatsu's wife Yuko was at her office when the magnitude 9.0 earthquake that spawned the tsunami struck offshore at 2:46 p.m. At 3:21 p.m., she sent him an email: "Are you OK? I want to go home." That was the last time he heard from her. She was 47 when she died, and left a now 23-year-old son and 20-year-old daughter. "She would have loved to see her turn 20," Takamatsu said, referring to Coming-of-Age day, a holiday in January when people reaching 20 during the year celebrate, and women dress in bright kimonos. Of 13 people who sought refuge on the roof of the two-story bank building, just one survived. Four bodies were found, while the other eight remain missing. Only a handful of buildings have been rebuilt on the periphery of the shellfish-farming town, and a large swath of land remains empty. "She wrote, 'I want to go home,' " Takamatsu said. "Because I know that, that she feels that way, I want to look for her myself rather than depend on others to do it." Last Sunday, he and his instructor dived to a depth of nearly 7 meters (23 feet), spending a little more than one hour in the murky waters over the course of two dives. An old tire and other debris was scattered on the ocean floor.
} It will take many more dives before Takamatsu, who retired from working as an aircraft mechanic with the Japanese military and is now a bus driver, will be experienced enough to take part in underwater searches. "I haven't quite been able to get used to the buoyancy while diving," he said. "I need to get better, to find my wife." 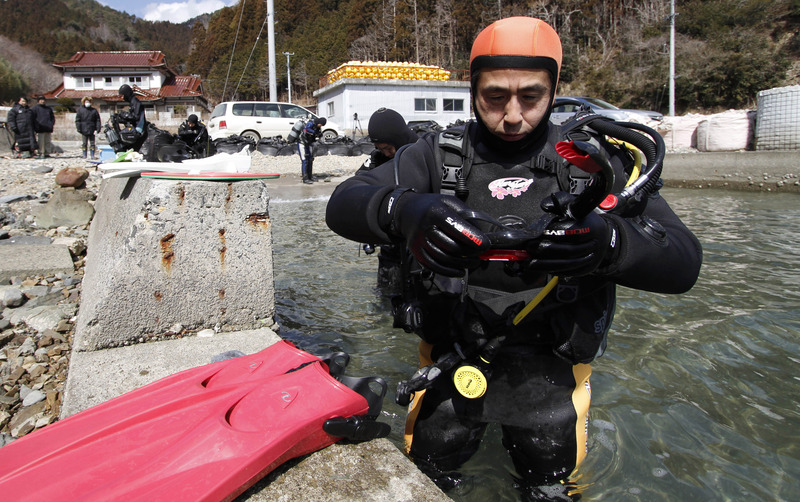 His diving instructor, Masayoshi Takahashi, conducts searches underwater with other volunteers at least twice a month. They still find belongings, and on occasion bones. Takamatsu is not asking for much, just something that would bring her home. "Of course, I hope her body would show up," he said. "I suppose it would be her remains by now. I hope I could find something."